There are lots of tips and tricks surrounding landscape hydration, and not all of them are true. Keeping your landscape looking green and beautiful in the summer heat can sometimes be difficult. That means you need to make the most efficient use of your water. There are lots of tips and tricks surrounding landscape hydration, and not all of them are true. Some may even surprise you! One of the misconceptions you might be most familiar with is the rule to give all of your plants an inch of water a week. The problem with this is that all of the different parts of your landscape will need different amounts of water. Newly planted or transplanted trees, for instance, will need more water than flowers and bushes that have been in place for several years. Make sure you give all of your lawn and landscape features plenty of water, especially during a summer heatwave. Plus, you need to be sure the water you give to your landscape reaches the roots of the plants. You might also worry about wilting. Wilting is indeed a problem, but it might not be because the plants aren’t getting enough water. If the roots don’t get enough water, they will die. But wilting can also be a sign that the roots are getting too much water. Look at how moist and wet the soil around the plants are, to make sure your landscape is actually healthy and not suffering from sort of disease that you don’t already know about. Sprinklers can be convenient to use when you need to water wide patches of your landscape all at once. You can use them, but you shouldn’t rely on them. When you water the plants, flowers, and other landscape features directly, you can make sure they get enough water. Otherwise, the water might evaporate before it can reach the roots. Drought conditions aren’t exclusive to the summer, but it’s easy to see why the hot and dry conditions associated with a drought can only seem like a problem in the summertime. All plants need some sort of hydration to get through the summer heat. 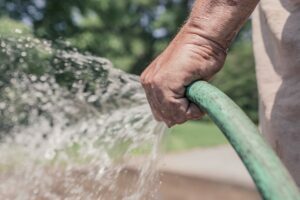 Talk to the professionals at Atlantic Maintenance Group to learn exactly how you should be watering your landscape! This entry was posted on Friday, July 20th, 2018	at 10:16 pm	and is filed under Landscaping Maintenance	. You can follow any responses to this entry through the RSS 2.0	feed. Both comments and pings are currently closed.